This manual is designed as a “textbook” for an 18-session training course, and is not intended to stand alone without the in-class training. 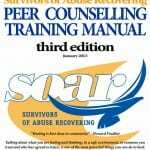 However, there is a lot of useful information, particularly in the Resources section, that can help survivors in their healing journey. Watch this web site for notices of upcoming training courses offered by S.O.A.R. Click on the picture of the English manual to download a PDF version to read. This version cannot be printed. If you would like to purchase a printed version in a binder, the cost is $35 plus postage. Également disponible en français (sauf pour la section Ressources). Cliquez sur l’image du manuel français pour télécharger le manuel en français. Cette version ne peut pas être imprimé. Si vous souhaitez acheter une version imprimée dans un liant, le coût est de 35$ plus frais de port. – Mike Lew, The Next Step Counseling & Training, Brookline, MA.